Bandages infused with electricity – known as electroceuticals – have only been around since 2013, however, it's not well-understood how they work, and therefore, how they can be improved upon. Successful medical devices as these have enormous potential for use in aerospace, defence, healthcare and veterinary settings. A research team at Ohio State University (OSU) have produced a study where they looked at how these bandages kill bacteria around the wound. Associate professor mechanical and aerospace engineering, Shaurya Prakash, a co-author of the study, said the goal with chronic and non-healing wounds, if infection is present, is to remove the biofilm. Biofilms are small communities of micro-organisms (that include bacteria) that live on the surface of the skin or wound and are held together by extracellular polymeric substances (EPS). These are generally made up of fats and proteins which creates a barrier that protects bacteria from traditional clinical treatment options such as antibiotics. 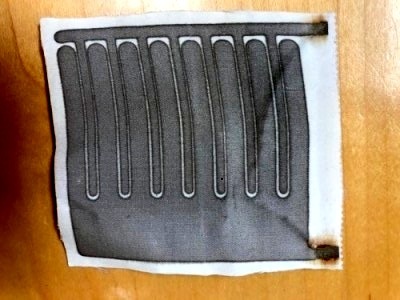 The team at OHU used haboti silk, a common Japanese weave, silk-screening silver lines onto the silk and attaching a small device to deliver electricity to the biofilm. When the electrified bandage was applied to bacteria-laden biofilm in the lab, it disrupted the bacteria enough to destroy it. Interestingly, the team saw the bacteria continued to die off two days after the electric current was turned off, the university revealed. "Their theory, based on these experiments, is that the bandage and electric current produce a potent antimicrobial chemical—hypochlorous acid—that takes over and kills bacteria without harming the healthy skin nearby," OSU said. While the study was conducted in vitro, A/Professor Prakash revealed that a few prototypes were sent to the university's College of Veterinary Medicine in late 2017 where they were used on a dog's open, infected wound that was not healing despite antibiotics. Within a week of using the bandage, half of the wound had healed, and within 11 days the infection had gone. A/Prof Prakash said the results are promising and his team hopes to conduct further studies while collaborating with microbiologists. The results of this study were published in Scientific Reports.